Today we’re sharing a piece of American history. 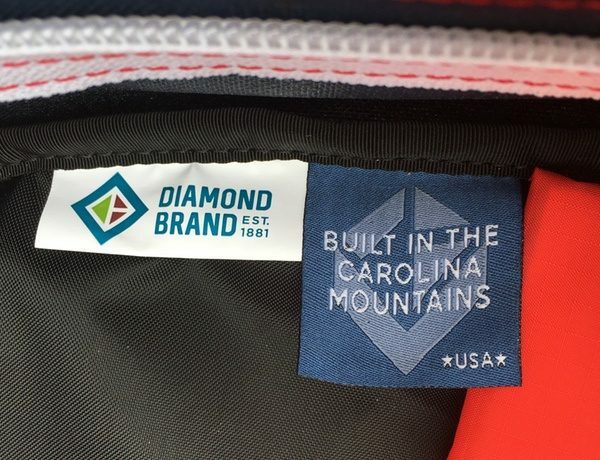 The Diamond Brand Gear Company has been making tents and camping gear in the U.S.A. since 1881. 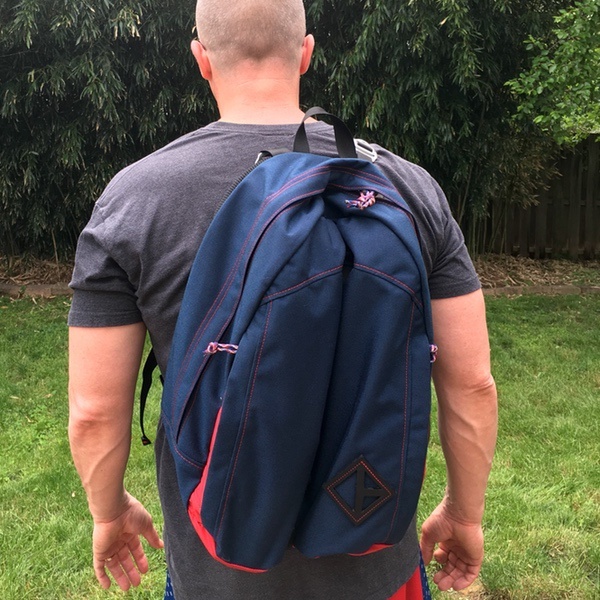 I’m reviewing the latest edition of their iconic Belay Bag, a daypack made for exploring on and off the grid. Let’s get packing! 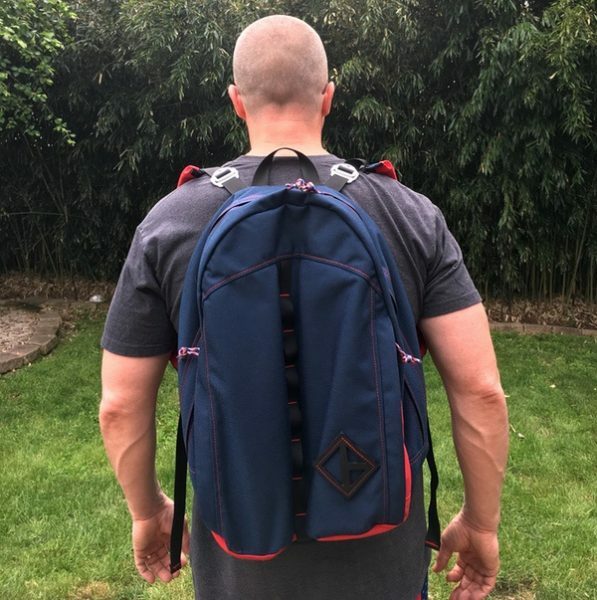 It’s a 22 liter daypack with a fully adjustable harness system that converts from a backpack to sling bag. 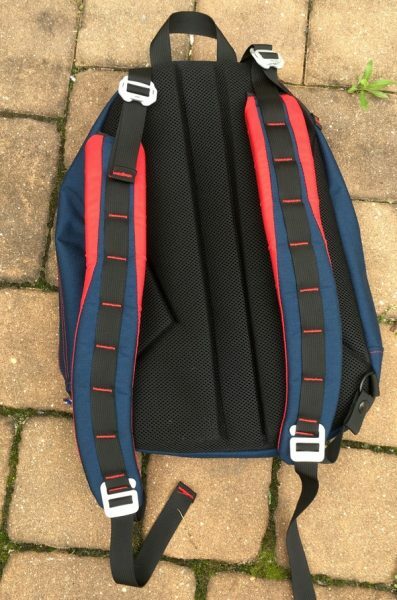 The package includes the pack, 2 adjustable/removable shoulder straps, and an extra set of pull chords if you want to change up the colors. Diamond Brand Gear supplied the U.S. military in World War I and II, and made the first packs for the Boy Scouts of America in the 1930s. The Belay Bag was first introduced in the 1980s. There’s a lot of history here, and the Belay Bag does a nice job of presenting a contemporary design that still pays homage to it’s roots. You’ll find a lot of heritage-inspired design elements in the Belay Bag: the bullet-shape, the bold pops of color, and the big ol’ Diamond-branded leather lash tab on the front face of the pack. But the whole look is pulled together with a clean, sophisticated treatment that works just as well on the street as it does on the trail. The profile is streamlined and modern, and those bold pops of color are tastefully placed to accent the form of the bag. It’s definitely at home in business casual workplaces or city commutes, standing out against the sea of black and grey business bags. 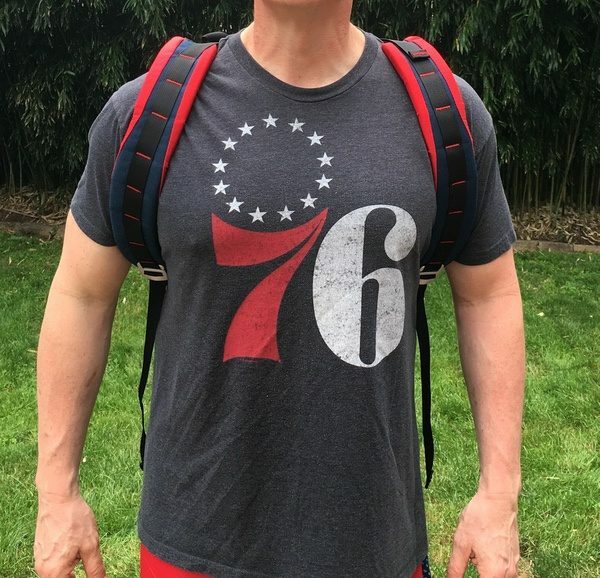 One of my coworkers complimented me on it’s “fashion forward” style in a recent meeting. Seriously. Those were his actual words. The form factor is that of a clamshell top-loader. 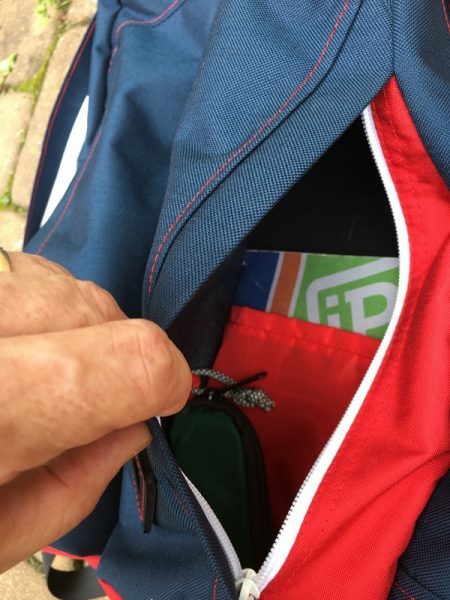 A pair of zips open down to just about the bottom of the bag, which is great for allowing easy access to main compartment while ensuring that things don’t tumble out when the bag stands up. A simple padded sleeve protects your laptop (up to 15”) and a tablet, and there’s a zippered pocket at the top of the bag (on the front face) for little odds and ends. 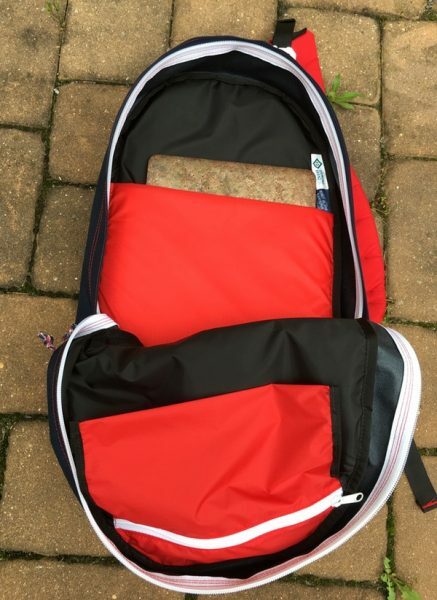 It’s simple and functional with room to spare (19” by 12” by 6”) for a lunch, a sweater, and assorted extras. The front face of the bag features two HUGE external pockets, each of which is 14” tall and 2-1/2” deep. Either pocket will house a big hydration bottle or a rolled-up light jacket. 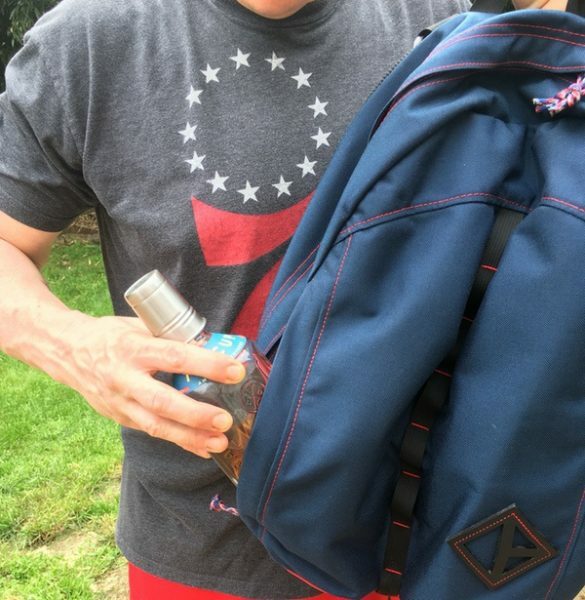 They’ll also each take a 32-ounce growler or a bottle of your favorite party beverage (I like to bring whiskey) so that you’re ready for the next gathering. 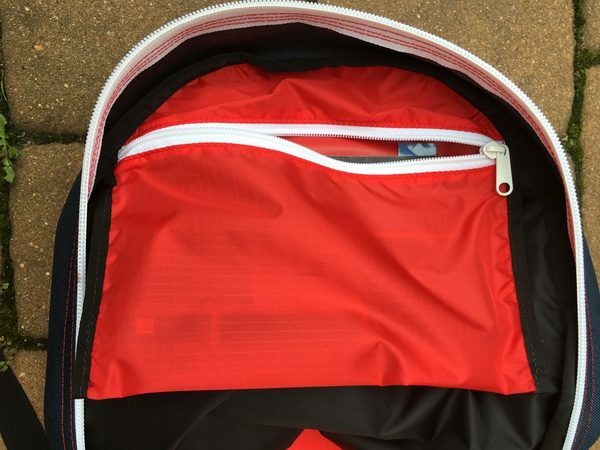 Each pocket also has a sleeve on the rear face to manage smaller items. The zips stop short of the bottom of the pocket, so you can toss loose items like your keys in there without fear of them falling out. They are great multifunctional spaces that extend the overall functional flexibility of the bag in day-to-day situations. At a 22 liter capacity, the Belay Bag fits perfectly in the daypack category: room for extras, but not so much that you’re feeling like you have too much bag for day trips. If you are hitting the trail, you won’t lack for outboard attachment points. 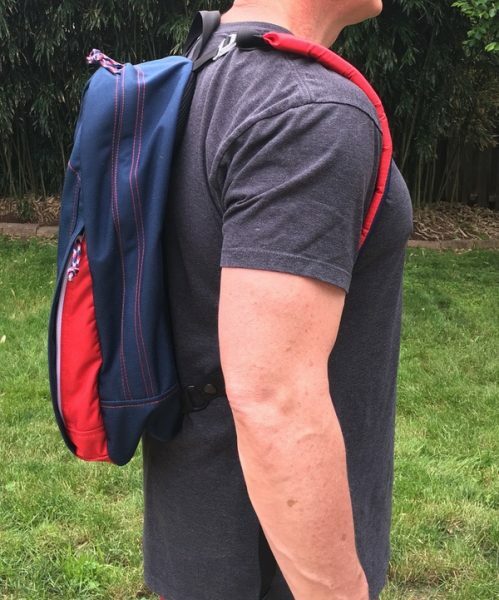 Strips of nylon loops on the front face of the bag and the shoulder straps give you a total of 22 places to hang axes, tripods, ball caps, cell phone pouches, a bedroll, walking sticks, a wet gear bag… you name it. The possibilities are endless. 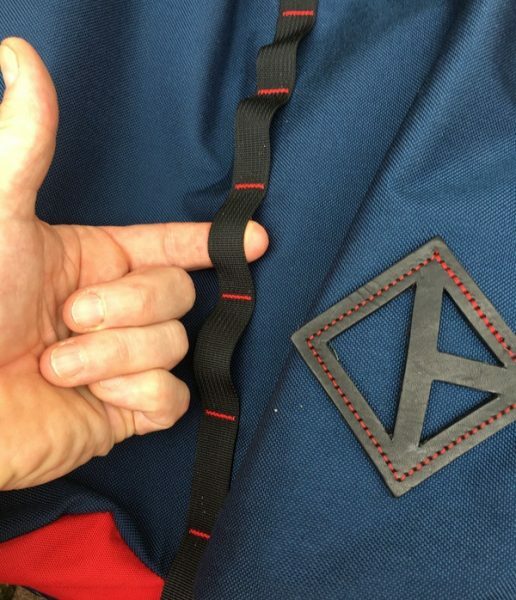 Diamond Gear placed an emphasis on comfortable carry with the new Belay Bag design. 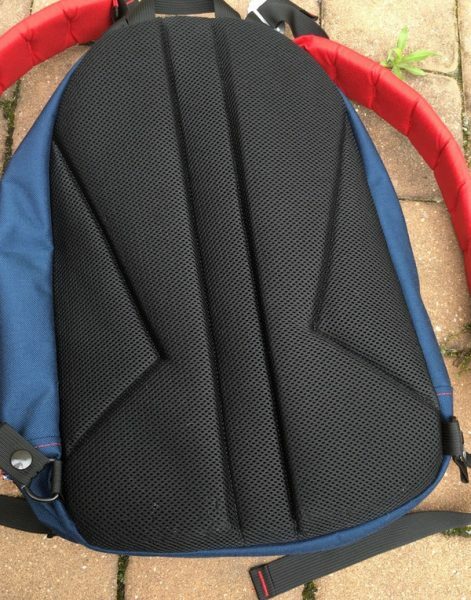 The back pad is thick closed-foam with a mesh cover, designed with an open center channel for air circulation. The attachment points at the top and bottom of the shoulder straps are also completely adjustable to your shoulder width and body type. The strap pads contour slightly at the hips to reduce rubbing against your sides. It’s really comfortable for all-day wear. The Belay Bag has another trick to play: it converts to a sling bag. 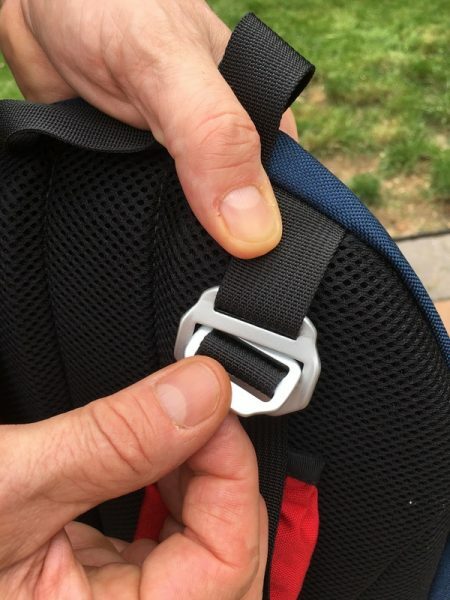 Quick release metal tabs at the top and buttoned loops at the bottom allow for quick removal of the shoulder straps. Take one strap and re-attach it at the opposite shoulder, loosen up the leads, and the bag wears cross-body like a messenger bag. It’s not an afterthought, either: the bag is designed to works really well in both configurations. 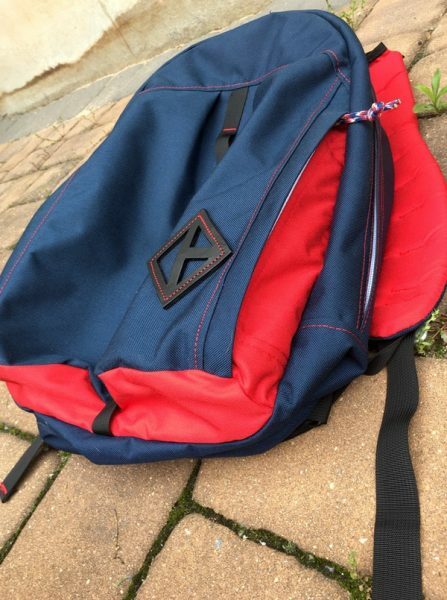 I actually prefer using it in sling mode given the bag’s size… think of it like a vertically-oriented messenger bag. Construction is excellent across the board. 1000D Cordura nylon is the primary material. Upcycled materials from tent production (70D Ripstop with Polyurethane Coating) are used in the pockets, adding a cool little sustainability bonus. Metal hardware and YKK zips are used throughout. It’s a solid utilitarian build that matches the personality and multipurpose usability of the bag. I do have two minor design improvements that I think would help the bag. 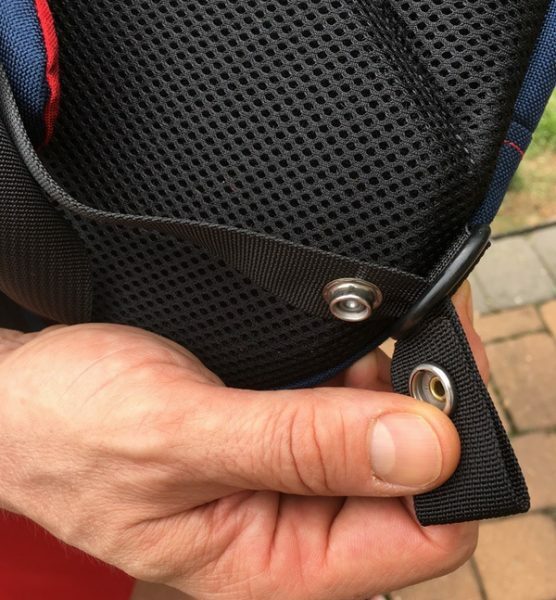 The internal zip pocket kind of flaps about, and could probably be attached to the front face so it doesn’t get in the way when you’re digging in the bag. 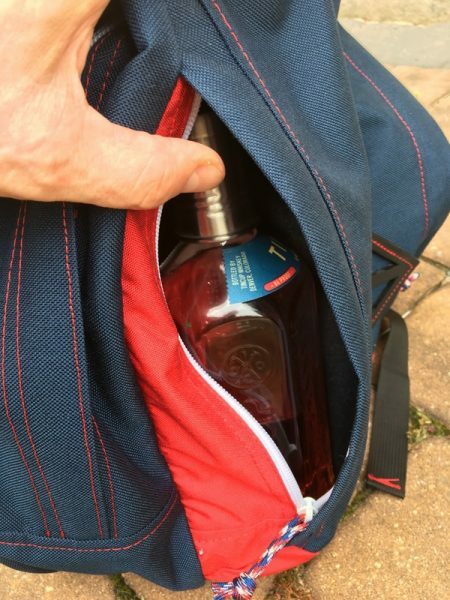 I also wouldn’t overpack that pouch, because it gets in the way of reaching stuff in the main compartment. The shoulder pads are a bit blocky and stiff, and could probably use a touch more refinement. But these are both extremely minor issues. Made in the Carolina Mountains, the Diamond Gear Brand Belay Bag is an ideal multipurpose daypack. While it’s not a heavily tech-focused bag, the usability is solid as a daily work commuter that will adapt seamlessly to travel and off-road exploits. The big external pockets and plethora of attachment loops, while subtly rendered in the design, make the bag super-adaptable. 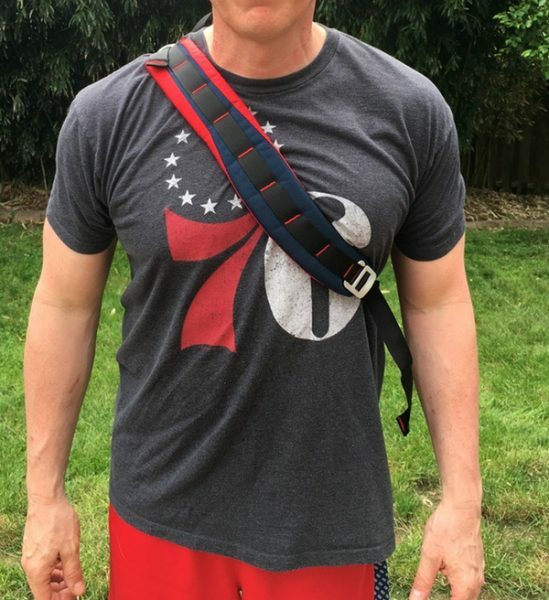 It is very comfortable to wear for extended periods, and the easy conversion to a sling-style bag is a well-executed bonus. It’s rapidly becoming one of my favorite all-around performers. I’ll be giving it some more in-depth travel testing in the next few weeks! Where to buy: But direct from Diamond Brand Gear or on Amazon. Additional colors are also available. Source: The sample of this product was provided by Diamond Brand Gear.